Very nice place with friendly & helpful staff. I would recommend this hostel to anyone! I hesitated because of the title, but I am happy to report that while family and kid friendly, there were plenty of other mature guests. The staff is friendly, the grounds are a nature lovers dream and the bus stop is literally outside! The bed was really soft, so I sleep very well. It was clean and all the people were nice to us. And specially the breakfast was really taste good and at no charge. If you stay at least two nights, you get a card which enables you to use all local cable cars and buses for free. Everything was great! The rooms looked very clean and inviting. The washrooms were well maintained. The staff were very sweet and helpful. Even the breakfast spread was great! Great experience! It was clean and comfortable. Breakfast and dinner was great! Ordered sandwich to go. CHF5. Choose your options. The best sandwich! Included lettuce tomato and pickles! Ask to have salad parts wrapped separate so they don’t sog the bread. Suggest they include a napkin in the bag. Clean hostel very quiet too Bus #3 to their front door. CHF 3. 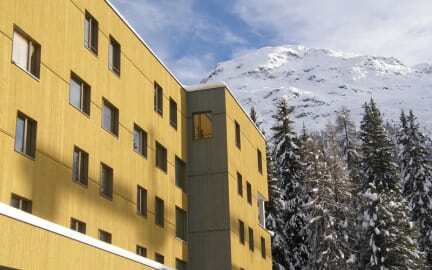 Overall stay at the St Moritz Youth Hostel was positive. The rooms were very clean and a decent size. The breakfast included was very good and there was lots to choose from. We also decided to pay for the dinner which was very good on the first night but not quite as good the second night. The staff were incredibly friendly and gave us lots of tips of places to visit. The location however was a decent walk out of the main town but there is a bus stop right out the front of the hostel! A very basic but clean hostel which is overpriced when compared in hostels in Luzern at least for a single room. The mattress on the bed is only 100mm thick so you can feel the wooden slats under it, the pillows are also very hard so not easy to sleep. 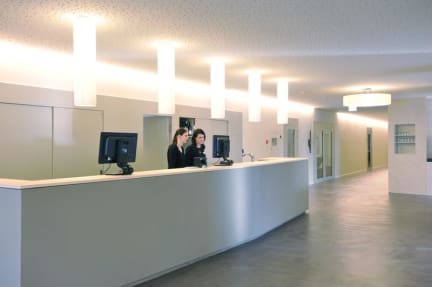 Very modern hostel with everything you need, only if you want it, you'll have to pay for it ! When I stayed, staff seemed on edge, not very happy or smiling.....which then then leads to a dull atmosphere !